A provost of Paris, France; born at Dijon; died in Burgundy in 1382. He was in office at the accession of Charles VI. (1380), when the populace, irritated beyond endurance by the taxes levied upon them, demanded of the king that "Jews and usurers be expelled from Paris" (J. des Ursins, "Histoire de Charles VI."). Without waiting for the king's action, "some of the lower classes . . . ran about the city, . . . entered about forty of the Jewish houses, robbing them of plate, jewels, clothes, and bonds" (ibid.). For four days the dwellings of the Jews were attacked and thus pillaged. The mob rushed upon the terrified Hebrews, cut their throats and tore from the arms of mothers infants whom they hurried to the churches so that they might be baptized (Halphen, "Legislation Concernant les Israélites," Introduction). Aubriot earnestly pleaded the cause of the Jews before the king, and through his influence succeeded in obtaining a royal decree, ordering the restoration of the children to their mothers and the restitution of all property taken from the Jews. 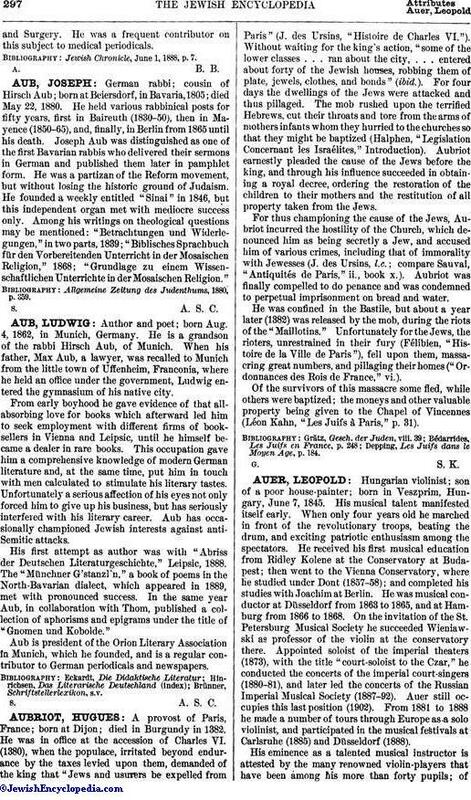 For thus championing the cause of the Jews, Aubriot incurred the hostility of the Church, which denounced him as being secretly a Jew, and accused him of various crimes, including that of immorality with Jewesses (J. des Ursins, l.c. ; compare Sauval, "Antiquités de Paris," ii., book x.). Aubriot was finally compelled to do penance and was condemned to perpetual imprisonment on bread and water. He was confined in the Bastile, but about a year later (1382) was released by the mob, during the riots of the "Maillotins." Unfortunately for the Jews, the rioters, unrestrained in their fury (Félibien, "Histoire de la Ville de Paris"), fell upon them, massacring great numbers, and pillaging their homes ("Ordonnances des Rois de France," vi.). Of the survivors of this massacre some fled, while others were baptized; the moneys and other valuable property being given to the Chapel of Vincennes (Léon Kahn, "Les Juifs à Paris," p. 31). Depping, Les Juifs dans le Moyen Age, p. 184.